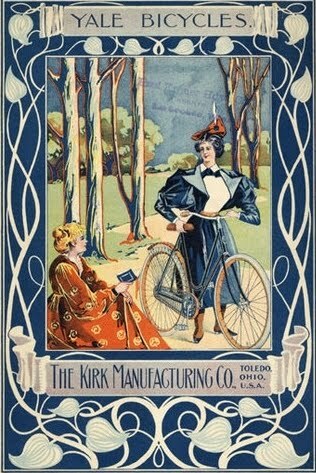 Lennie's Diary - 1898: Wherein Lennie Works, Bums, Plays in the Band, and Bikes! 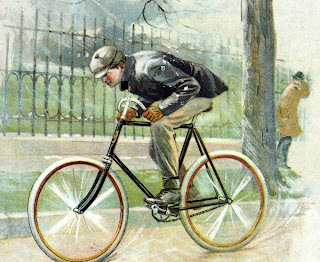 Wherein Lennie Works, Bums, Plays in the Band, and Bikes! Our hero, Lennie Davis, works on neighboring farms all week, thrashing oats, shelling corn, fixing fence. Finally, on Friday afternoon, he gets some time off and bums around town. And in his entry for August 27, he goes bicycle riding! Frank went to Chicago. Art & Charlie came down. Walked out to Petersons. Thrashed for Dillon until 4 PM. Stacked oats rest of day. Finished stacking oats. Fixed fence. Came home. Went out to Porters (sp?) with Ida LeMay. Shelled corn. Bummed around town in afternoon. Helped ?? (sp?) in shop. Hotest day in Neb for years. 104 degrees. Another week has gone by. The weather has turned hot. This following week Lennie takes time off to play. Another hot day. Went to Presb Church. Took Ed and Ells (Ellis Paulson) home. A hotter day than Saturday. Band practice. Went to lecture at Prest. Church. Fixed pictures in this book. A nice day. Worked for Edmond & Bradford. Went down to tennis court. Helped George and Charlie put up hay. Got a letter from Sioux City to play for Carnival. Guy and I went out to the country on bikes. Aha! Lennie is enjoying the weekend! We wish we had a photo of his bicycle, but we don't. 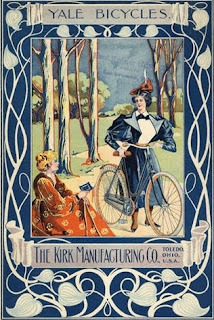 However, as you can see from the prints included here, bicycles haven't changed an awful lot, but costumes have! Especially for the gals!